Virtual reality is not simply a new trend in learning and development. From Walmart to NASA, VR is becoming increasingly prevalent in process and procedure training for a variety of industries, including retail, science, health care and hospitality. It’s not surprising why. VR offers a unique opportunity for employees to try out new skills in test environments that may be difficult to replicate otherwise. VR startup STRIVR found that using VR to train on soft skills such as empathy often results in better customer experiences. VR can even increase retention rates by more than 65 percent, according to the Masie Center. Even as VR technology becomes more widely used, there is one area of learning that remains untouched by the VR trend: brand training. Today’s consumer expects brands to be unique, authentic and innovative. It has never been more important for companies to distinguish themselves from competitors. To accomplish this, employees need to be high performers and brand ambassadors; arbiters of the company’s heritage, culture and values. Can incorporating VR technology into brand training transform employees into life-long advocates? How can companies create evergreen VR content that gets every employee on brand? In its exact definition, virtual reality is a computer-generated environment that viewers can interact with via headset. However, there’s another form of immersive content that can be viewed through a VR headset referred to as “virtual reality,” though there is nothing virtual about it: 360-degree video of prerecorded footage that immerses viewers in a real-world environment they can view from all angles but cannot interact with. Because VR is used colloquially to reference both virtual reality and 360-degree video, the term “VR” in this article will encapsulate both technologies. Successful brand training is highly dependent on crafting stories that are relatable, shareable and inspiring. VR offers a unique opportunity to take employees to places they have never been before and may never have seen otherwise. Imagine virtually travelling to amazing places such as Disney’s Imagineer Studio, the garage where Steve Jobs and Steve Wozniak founded Apple or a top-secret production line for the latest Nike shoe. The 70/20/10 model tells us that 70 percent of what people learn is experiential. Rather than simply telling a story, VR places employees right in the center of the action to experience it in real time. The brand’s story becomes their own. When they leave training, they’re ready to share it with the world. Unlike product and process training, brand training is heavily focused on emotion. Companies must create compelling brand experiences that build excitement among employees, yet many are failing to do so. In fact, 43 percent of employees still believe their company’s training programs are “useless and boring,” according to a Digital Talent Gap study by Capgemini and LinkedIn. 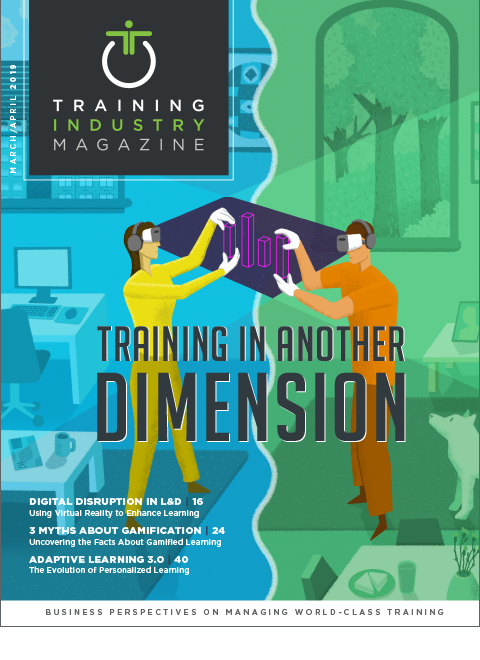 VR can help boost interest in training programs that employees may otherwise ignore. STRIVR found that the majority of employees who used VR say it’s the “best form of training” they had ever been through, as VR allowed them to react to the environment in real time and receive “physical and emotional feedback” that average classroom training does not offer. Successful brand training is highly dependent on crafting stories that are relatable, shareable and inspiring. VR can also greatly enhance retention rates. Participants immersed in an environment that engages multiple senses will walk away with a greater understanding and retention of the information. This is best explained by Benjamin Schöne, Marlene Wessels and Thomas Gruber of Osnabrück University’s Institute of Psychology whose studies have shown that viewers who consume content through VR, rather than conventional video, recall that content as if it were a memory of their own personal experience. Emotional connection to the experience leads to a stronger ability to both recall and repeat that story to customers, friends and family. Global and national brands with franchise locations present a unique training challenge. When management practices vary from location to location, it can be difficult to ensure that all franchise employees embody the brand in a consistent and seamless way. Because VR increases memorable recall in employees through an emotional and personal connection, it also helps to bridge the gap between company goals and franchise practices. Whether in Paris, Kentucky or Paris, France, offering a singular story ensures that employees will receive consistent brand training. This will minimize any potential learning variances among different training locations. Though the upfront cost may be higher than standard L&D technology, the long-term value of VR can’t be ignored. Using VR to tell a brand story can transport thousands of employees anywhere in the world for a fraction of the cost. VR content can also be leveraged in the future in several ways, including ongoing and future brand training, on-demand learning, consumer engagement, shareable videos and more. And as with any newer technology, VR costs will reduce as consumer demand and VR competitors increase. Follow these best practices to begin crafting VR content that fully immerses employees in your brand and leaves them with stories they can remember and share. Creating VR content that both tells an intriguing story and achieves key learning objectives is crucial. Before VR production can begin, start by storyboarding an outline with your training objectives in mind. Plot out every action that happens on screen and ensure that each VR experience offers clear takeaways. VR technology can add excitement to any training program. However, if only used to add a “wow” factor, the story will fall flat. Follow up an engaging VR experience with activities, debriefs, word tracks and additional learning aids to reinforce and enrich what they’ve just seen. Use VR as a jumping off point to dive deeper into your brand story, rather than the main event. When producing your VR brand story, make sure to avoid including any elements that could date your content and prevent it from being used after your training program ends. This can include model year products, current events or specific dates not related to your brand’s heritage. VR content that can stand the test of time will allow you to leverage that content well into the future. VR inherently allows users to control their own experiences by letting them choose where to look at any given time. This adds an element of personalization, as well as the potential for missed information. If a participant happens to look up when the main action is straight ahead, they could miss the story’s takeaway. To prevent participants from potentially missing key takeaways, incorporate “triggers,” such as a beep, a narrator or an arrow, into the VR experience to prompt participants to look in a certain direction. Make your VR content available on employee training portals once the program is complete. This will allow all employees—whether they attended your event or not—to review and share your VR brand stories at any time, leading to increased retention and continued ROI. Keep in mind that many of your participants may not have used VR before. Allow ample time during training to set up the VR experience and provide participants with specific instructions (e.g., what buttons they can and can’t touch, when to put the headset on, etc.) This will help participants understand what they are about to see and how to operate their individual VR headsets. If possible, provide support staff to help with any technical difficulties during the session. VR is a robust technology that’s only beginning to make its mark on the L&D industry. As most organizations use VR to train on process and procedure, there is a growing opportunity to close the gap between VR use and brand training. Done right, VR is an invaluable, evergreen brand training tool that can help industry leaders share engaging stories, transform employees into brand ambassadors, and increase their program ROI for years to come. Amanda Jenkins is a writer for the Apex Agency, a marketing, training, media event and travel firm that specializes in strategic and creative event solutions.